IMAGE: THIS IS LOHITASH KARUMBAIAH (CENTER) AND MEMBERS OF HIS LABORATORY. 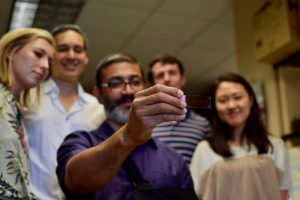 Athens, Ga. – Researchers in the University of Georgia’s Regenerative Bioscience Center have succeeded in reproducing the effects of traumatic brain injury and stimulating recovery in neuron cells grown in a petri dish. This makes them the first known scientific team in the country to do so using stem cell-derived neurons. The procedure, detailed in a new paper in Nature Scientific Reports, has significant implications for the study and treatment of such injuries. Unlike other cells in the body, most neurons in the central nervous system cannot repair or renew themselves. Using an agent called glutamate that is released in high amounts in the brain after traumatic injury, the research team recorded a concussion-like disruption of neural activity in a dish containing dozens of minute electrodes.